You can check out my other reviews for Zion National Park. 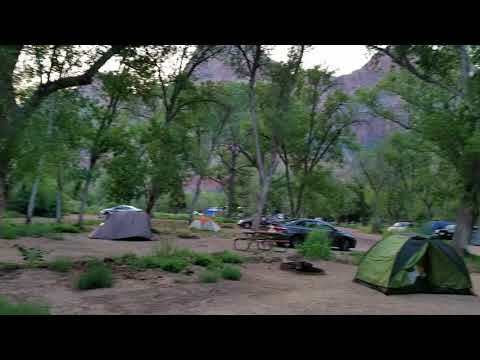 Make sure you don't get confused, there is only one south campground at Zion National Park. If you are looking for long term reservations then you need to camp at Watchman. if you can take the risk of a first come first serve campsite and you have missed your window for getting a site at Watchman, then take your chances, it is worth it. But get there early, before 7:00 a.m. The campground fills up quickly. Zion is becoming more poular every year. Expect big crowds. Incredible views, a little crowded. The views from the site were incredible and had access to one of the trails. Also right next to the visitors center to catch the shuttle. Campsites are very close together which made being right next to screaming kids a little unbearable. Our site was also on a slant which made use continually slide to one end of our tent all night. Overall it was convenient and a beautiful campsite. The South Campground in Zion is less popular than the Watchman Campground. There seemed to be less RV's in South, which for me is always a plus. I visited at the very beginning of October and if was still very warm, the temperature never seemed to drop at night. All I needed to sleep was a blanket, and not even my sleeping bag. Upon arrival, the campground hosts chose a spot for me based on the current availability. The challenge with camping in the park is that as soon as spots are empty they are taken so there is a constant turn over and you just take what you can get. The sites themselves are not all the private but a conveniently located to bathrooms, water, and trash. Unfortunately I was placed right behind one of the bathrooms and the sites are such that people were walking through on their way to and from the bathrooms. There is a river that runs along one side of the campground and if you're really lucky, you may get one of those sites. There are a few spots where you can access the river to relax or for a quick dip. The Pa'rus trail runs through the campground which makes is easy to get to the Visitors Center and shuttle stop (roughly a 5 minute walk). The town of Springdale is not far away and easy to get to through the southern pedestrian entrance. If you're looking for a hike and want to forego the shuttle lines and/or the crowds of Angles Landing (or maybe it just isn't your thing) I suggest the Watchman Trail that leaves from the Visitors Center. 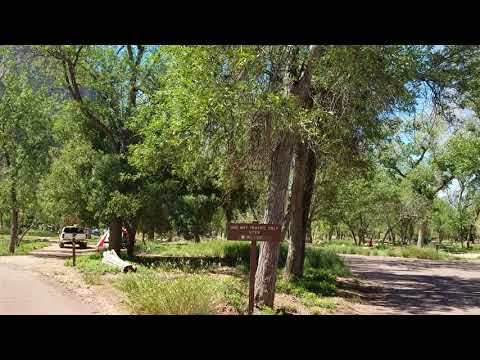 To enter the South-Zion National Park camp grounds you have to go through the park entrance and the camp grounds are just behind the parks entrance. There is drinking water, flush-able toilets, picnic tables, fire rings, flat places for a tent, dump stations. There is not however, showers, shade which can get hot on 100 degree days, there is no power, the ground is too hard to stake down tents, no trees for hammocks, the bathroom have huge spiders and filthy, there are plenty of rocks to sleep on! This is not the best camp site on the planet it is ok. It currently costs $35 to get into the Zion National Park and then it costs to camp at this site. With the amount of traffic this area gets and the amount of money flowing in they could put in a decent bathroom, one without bugs. I have good news there are lots of trails for backpacking and biking. If you'd like to go for a stroll to shower there are showers a little less than a mile away that cost $15 for 12 minutes. They aren't wonderful but they get the job done. They are however also filthy! Thank goodness I had my Oofos Oolala flip flops on hand to save my feet from whatever nasty germs were living in the shower floor that was covered in hair. There are some great places to eat close by to this camp grounds and great coffee! If you need any souvenirs there are plenty of places to shop! The South-Zion National Park campgrounds have a shuttle close by that drives guests to the trail for the well known, "Narrows". The shuttle comes with your park pass and is a hop on hop off transit. 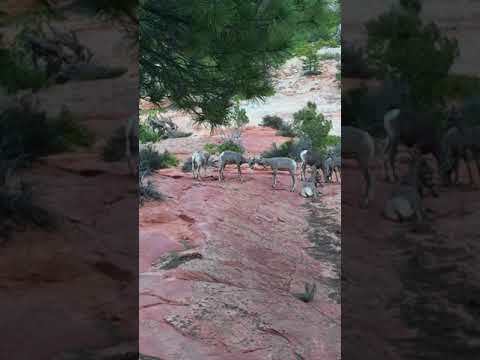 It is the easiest way to see some of Zions most precious wonders! Great campground right outside the park. Showers and laundry available. Ice available across the street. Big spots with lots of tree coverage! Great campground and well managed. It is only a short walk to the visitor center and a human history museum where there’s a shuttle stop. The campground hosts are really nice and the facilities are well maintained. Tent campers: Sites were a good size, even for multiple tents people pitched. My favorites are 68, 71, 72 and 74, walk to sites along the Virgin River that are a very short distance from parking. Full shade sites 68 and 74 are fantastic sites as long as you don't mind the Pa'rus Trail traffic. See photos. Hammock users, there are rules emphasized by the host when you check in; see photo. Small units such as truck campers, popups, campervans and small Class C campers. Our teardrop trailer fit well. Best feature: You don't need your vehicle after you arrive. Walk to shuttle bus stop 5 to 10 minutes away at the Visitor Center where you have to take a shuttle to get to the hikes and views north of the VC. From the VC, walk into Springdale where there are restaurants, one craft brewery/restaurant, a couple grocery stores, showers and laundry. There is also a free bus system in Springdale that runs to/from the park entrance near the VC. Our sites (73 and 70) had a 19 foot maximum vehicle length listed on recreation.gov. We could tell from the online photos that our teardrop would fit just fine even without turning it sideways. Pay attention to online photos and specs if you want shade. Many sites are in full sun, but we had partial shade at #70. Reservation policy: Reservations can be made two weeks before your stay, and you can only reserve three nights. We reserved a site for three nights and then waited three days to reserve a site for two more nights. Not all reservable sites will be available when you log on recreation.gov two weeks ahead of time because people have already made reservations for multiple nights. If you're a planner and electricity is important, you can make a reservation 6 months ahead of your stay at Watchman Campground across the river from South. Walkup: about 30 sites are not in the reservation pool. As we left at 7 am on a Friday morning, 10 vehicles were waiting to grab a spot. Amenities: Flush toilets, running water in the bathrooms and potable water. Only 2 of the 3 bathrooms were open, and they were never very clean a few hours after the morning cleaning. You can walk less than 10 minutes to Zion Outfitters and shower for $4 for 5 minutes. The Narrows: In the summer, catch a shuttle as early as 6 am so you can hike in without a lot of company and beat the heat. Shuttle line is long (think Disney) by 8 am but short in the early afternoon when it's hot. You can rent equipment (boots, neoprene socks and a hiking stick) in town. IMO the stick is a necessity even if you have good balance. I wore my hiking boots and socks and used my trekking poles. I had no rubbing/blister problems with wet socks on an 8.5 mile hike. Watchman 8 am hike with a ranger was easy but informative. We learned about the recent storm (7/11/18) that caused quite a bit of damage and closed several trails. Observation Point from Weeping Rock shuttle stop is an 8 mile roundtrip and has 2100+ feet of elevation change but is worth the effort, especially if Angel's Landing is closed as it was in late July 2018. Cars start lining up at 5:00 a.m. in hopes to snag a first come, first served site… but it's worth it. You join the line in your car, shut it off, and watch the early morning stars while you wait a few hours for the ranger to let you know when a site is available. Once you're in, you'll notice the Virgin River runs through the campground (and there's easy access to it) and the river is lined with large (for the desert) Cottonwood Trees. These trees allow for some shade, but expect your site to be in full sun for most of the day. Do your hikes early in the morning to avoid crowds and the heat… then wade in the shallow river in the afternoons. It's an easy walk across the bridge to the store (firewood, food, beer, etc. ), but bring your park pass with you, as the store is right outside the entrance and to you will need it to come back in. What an amazing trip! Backpacked across the Trans Zion Trail with a large group of friends. We reserved our sites well in advanced and then made sure to get the office very early to secure our reservation. We did a lot of primitive camping. Make sure to bring water filtration if you’re going backpacking as there are streams to grab some water along the way. Campsite at south booked fast as well.